This fully fenced property is on a county island in the middle of city limits, in the center of Flagstaff, minutes to downtown and Interstate access. 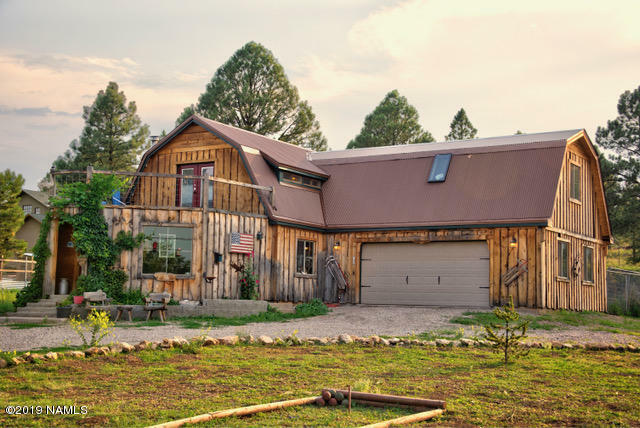 This unique, rustic looking home sits in the middle of .98 acres, and features an attached 348 s.f.mud room/passive solar greenhouse with Koi pond, 143 s.f newly constructed bathroom with 3 head walk-in shower, chefs kitchen, 360 s.f master suite with walk in closet and 2 car attached garage. New metal roofing was installed in 2018, new rough-sawn, raw-edge siding was installed 2017-2018.